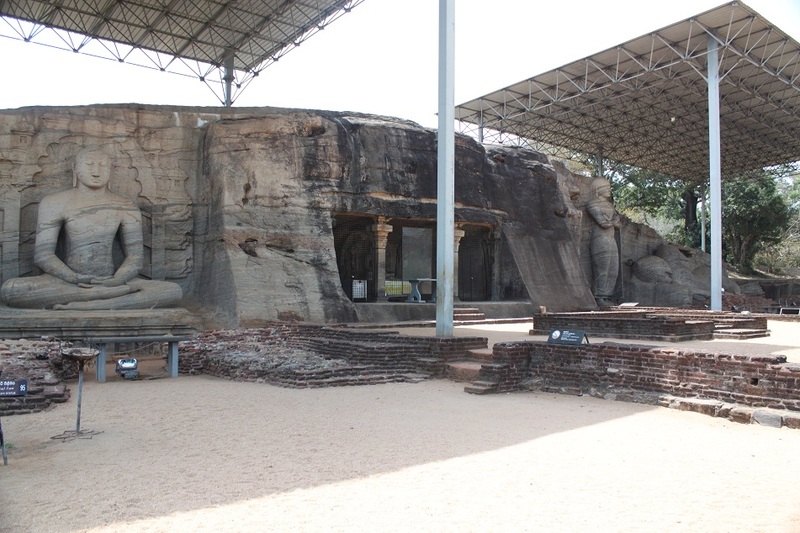 Polonnaruwa: A Timeless Elegance | What an Amazing World! 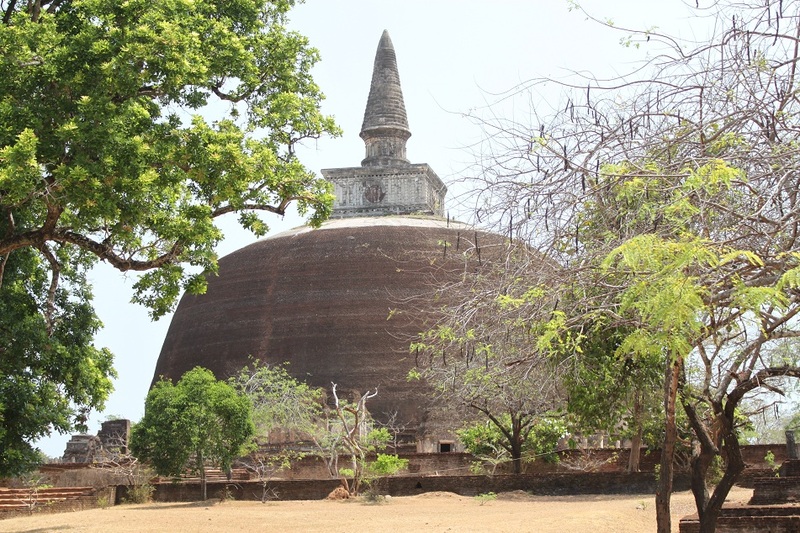 Almost like reacting to the sound of an alarm, I wake up just at the right time when we arrive at another Sri Lankan ancient town, Polonnaruwa. The sound of rushing water in a canal where local men and women bathe to escape the scorching heat welcomes me to this region in the island’s northern-central part – infamous for its year-long hot climate. 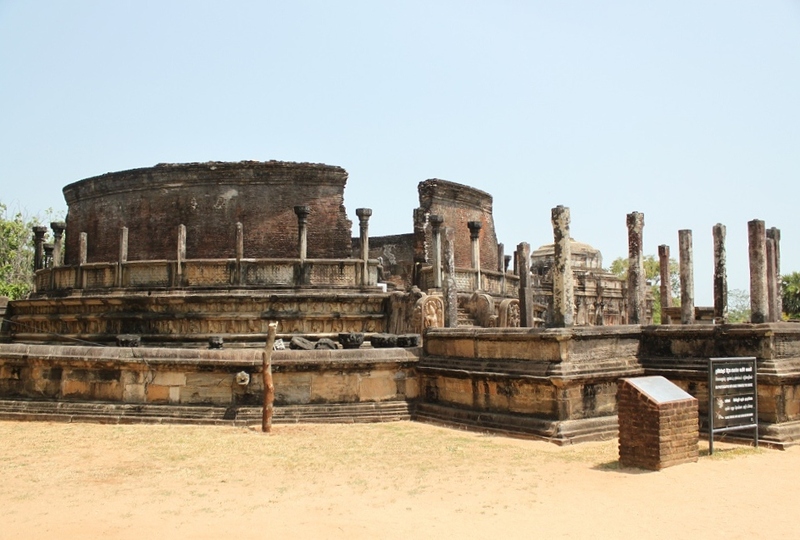 All canals have the same headwaters, an impressively large artificial lake, which together form a sophisticated water supply system from which the people of the ancient kingdom of Polonnaruwa get fresh water to sustain their lives. 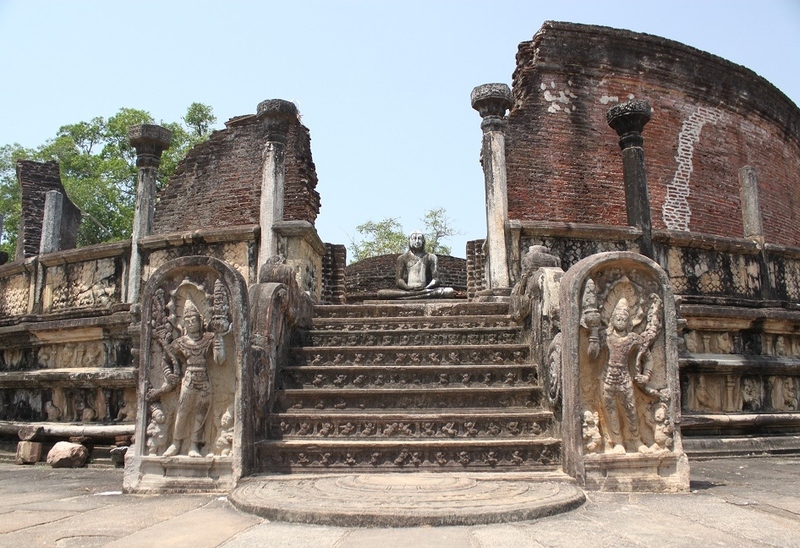 The kingdom of Polonnaruwa was Sri Lanka’s second most ancient kingdom, after Anuradhapura. However, it managed to establish itself as a highly independent and respectable kingdom for most of its time – the artificial lake is undoubtedly a silent witness of its old glory. 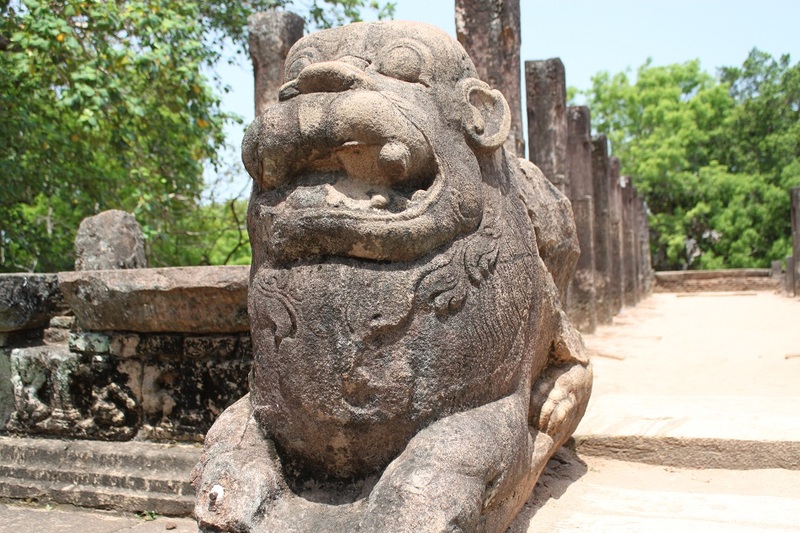 In the early 11th century, King Vijayabahu I reunited the country and declared Polonnaruwa the capital of the unified kingdom which lasted until the late 13th century when the island was once again invaded by an Indian kingdom. 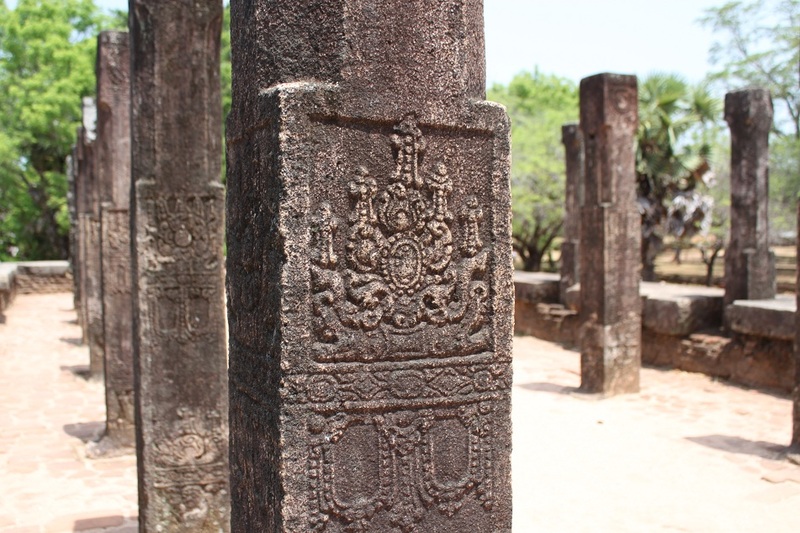 At the heart of the ancient kingdom, lies what once the royal palace complex which consists of the palace itself, the council chamber, the vatadage (Sri Lankan vernacular architecture of a Buddhist shrine), and some other structures related to the daily life of the kings and his family. All of them are in the vicinity of the lake. As I step out of the car, I can instantly feel the rather extreme heat under the blazing sun. Only a few other places could match such scorching heat in my entire life by far. Luckily, the majority of the most important archaeological sites in this ancient city are located within walking distance from each other. 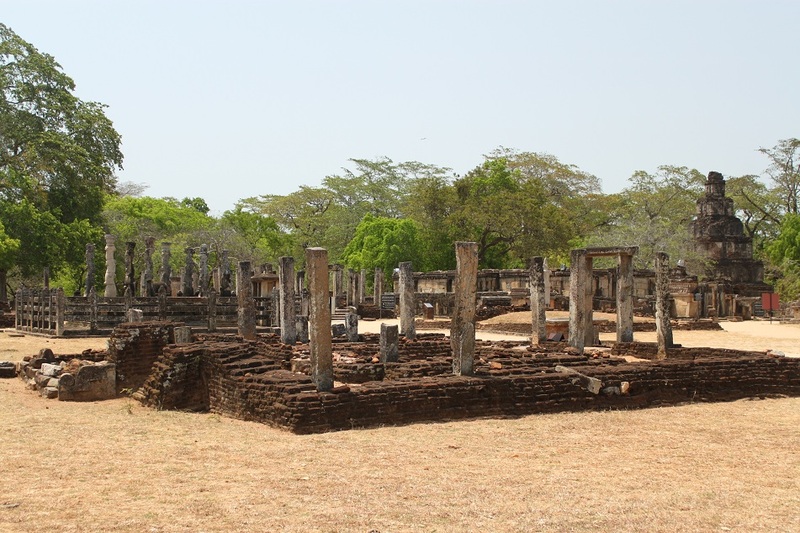 The Sacred Quadrangle which hosts the most ancient ruins is the focal point of any exploration of Polonnaruwa, as it also used to be the center of the kingdom’s religious life. 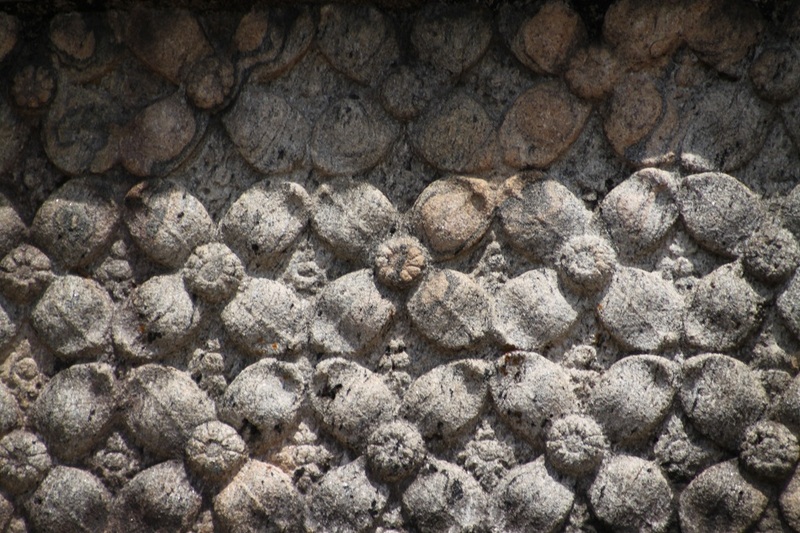 Containing a number of Buddhist shrines – one of them purportedly held the tooth relic of the Buddha and the alms bowl used by him – the Quadrangle is a place where you can marvel at some of ancient Sri Lanka’s best architectural styles, from the elegantly designed vatadage to the curiously-looking writhed stone pillars at the courtyard. 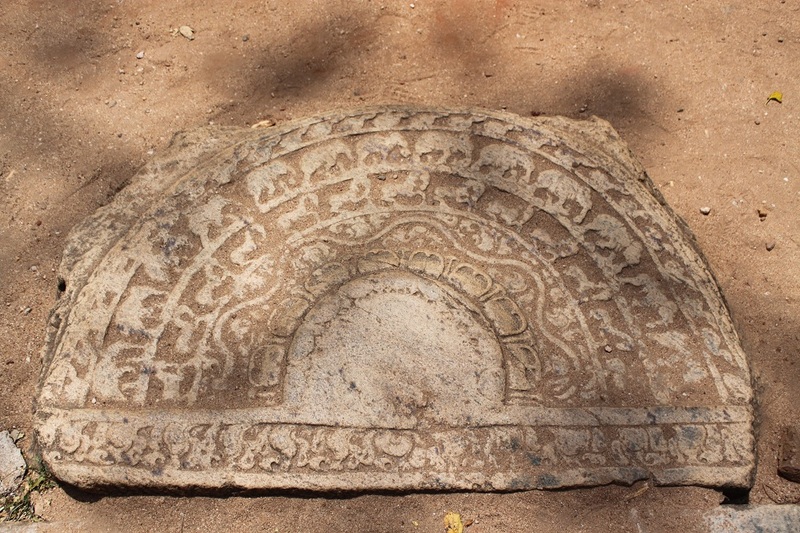 Not only at the Sacred Quadrangle, apparently ancient Polonnaruwa’s exceptionally creative society also materialized their unusual ideas at Gal Vihara, a few kilometers to the north of the inner city. 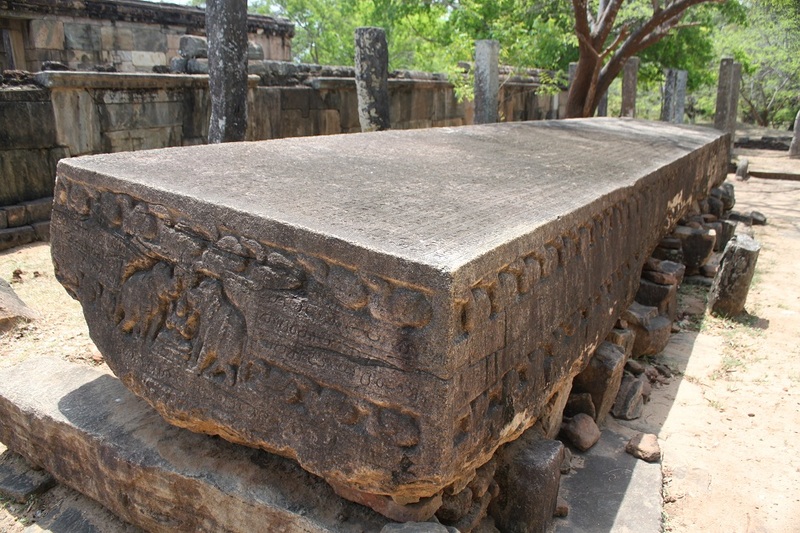 On an elongated large granite rock, four images of the Buddha were sculptured in such a fine technique that they are often considered as one of ancient Sinhalese masterpieces. 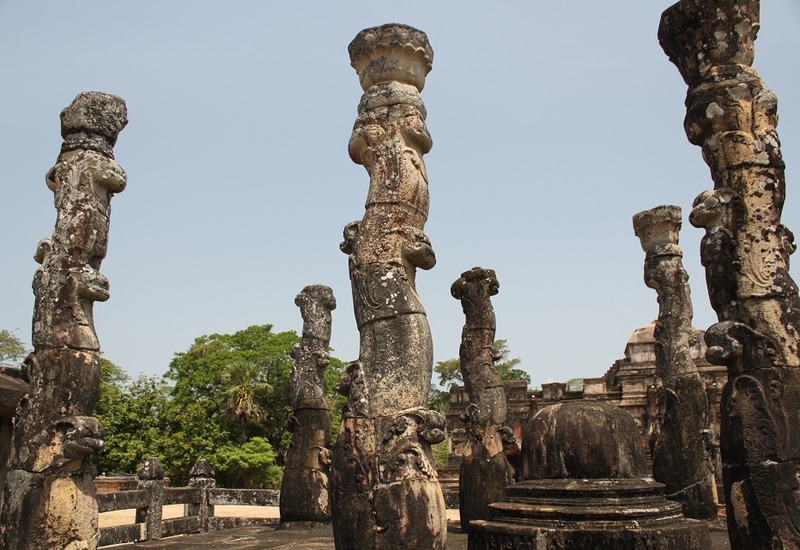 Constructed in the 12th century, the sculpted four images had endured the weather and sit as elegantly as ever, drawing visitors and pilgrims alike to this Buddhist shrine. 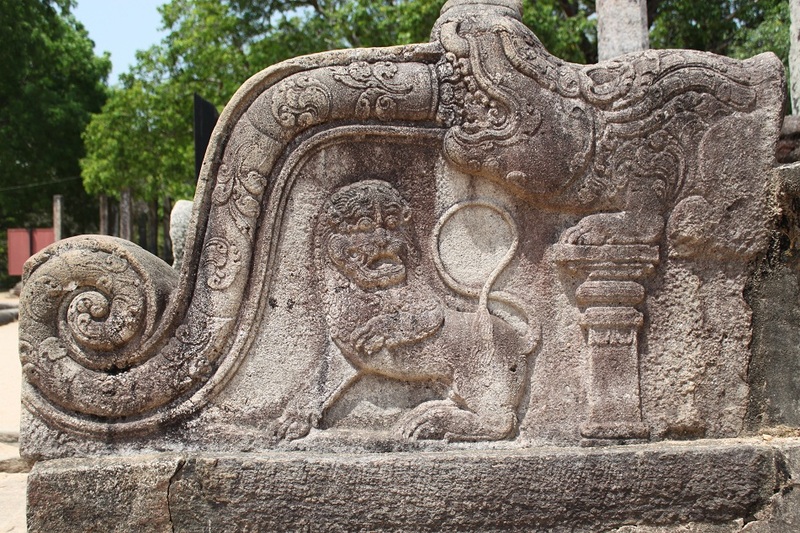 The Buddha is depicted in two sitting positions, one reclining and, interestingly, one in standing position – a very rare depiction of the Buddha. 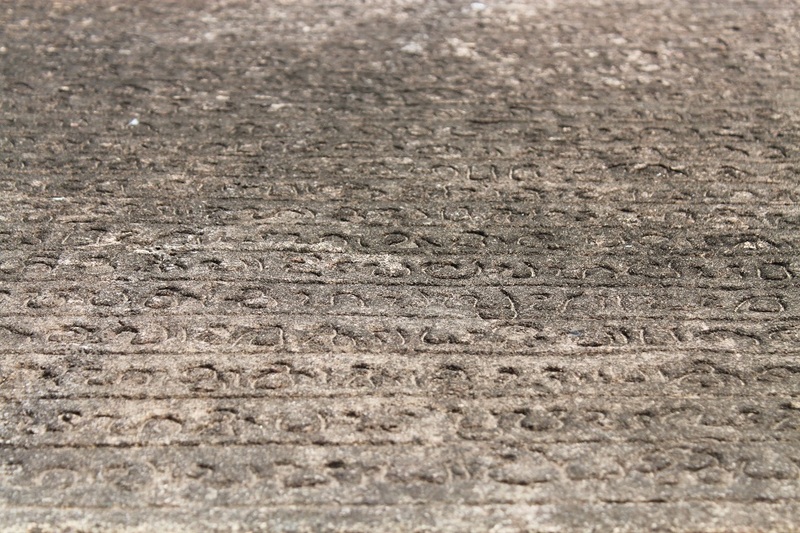 Another evidence of ancient Polonnaruwans’ penchant for doing things differently. 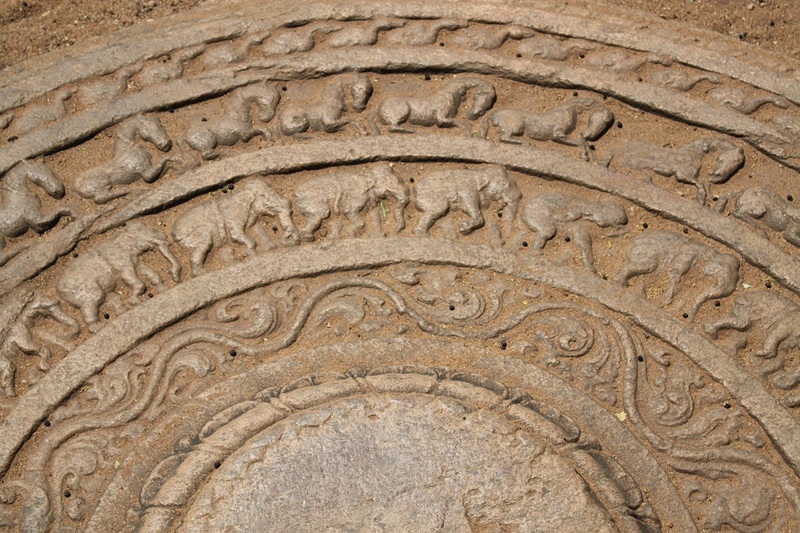 Earlier that day on our way to Polonnaruwa, instead of taking the much smoother highway, Suresh drove his car through a long dirt road on the perimeter of Minneriya National Park, hoping to spot some wild elephants. Unfortunately all we found was their droppings – not the sight we wished to see for sure. 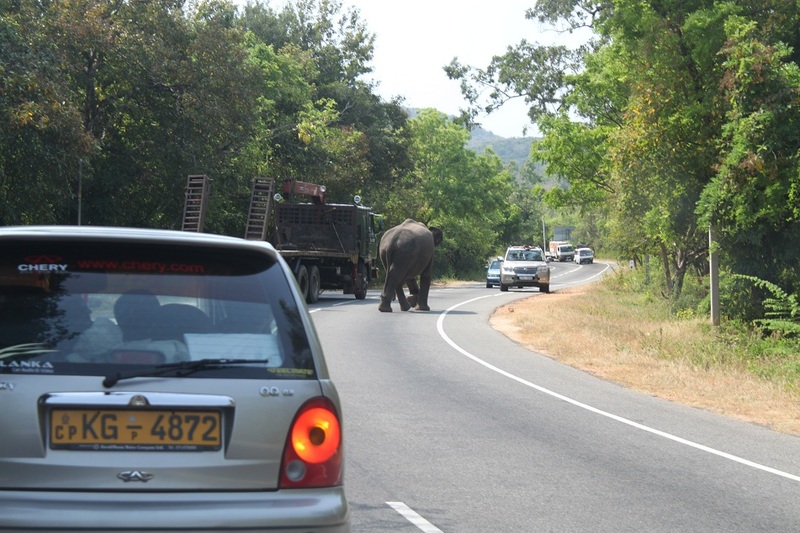 However the sight is actually quite intense as one old man is riding his old traditional vehicle when the wild elephant crosses the highway, forcing all cars to stop and wait in worry. But it is the old man’s lucky day because at the same time a medium-sized military vehicle happens to be around, giving him protection from any unexpected charge from the elephant. Everyone is waiting patiently until the elephant moves to the other side of the road. Cautiously passing by the seemingly gentle female elephant, Suresh slows down the car in order for me to be able to snap some pictures quickly. As if two victorious smiles on our face are not enough, a few hundred meters later another wild elephant is spotted, walking peacefully on one side of the highway. 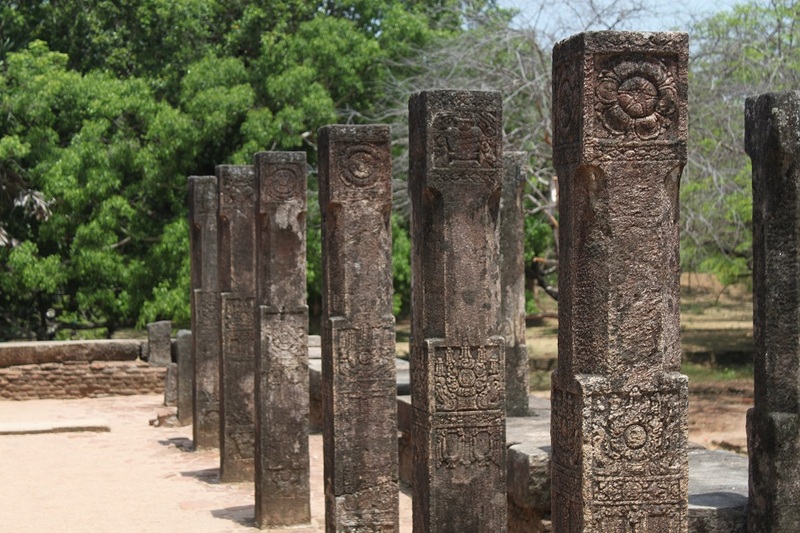 Such a perfect way to end my visit to the beautiful ancient ruins of Polonnaruwa, indeed. Those picture tells me that life is really wonderful.. Thanks for your lovely comment, Carla! 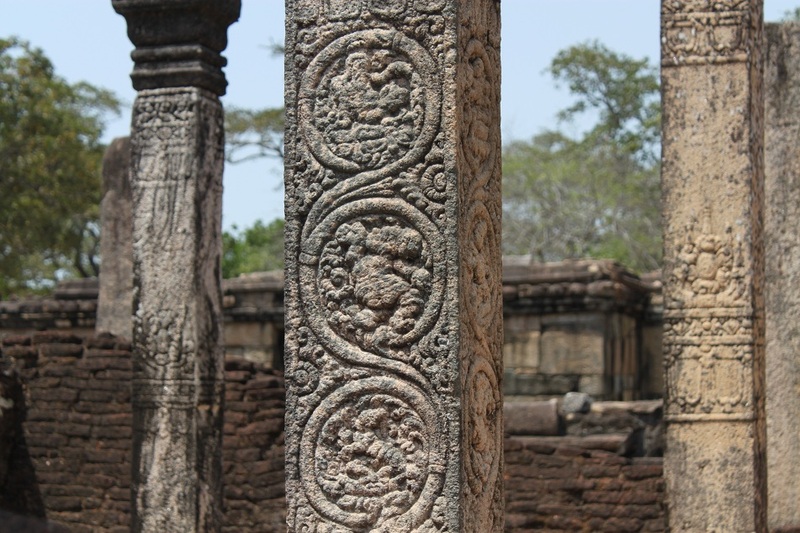 Love those ancient architectural structures! They’re very inspiring. 🙂 Keep it up! I agree. 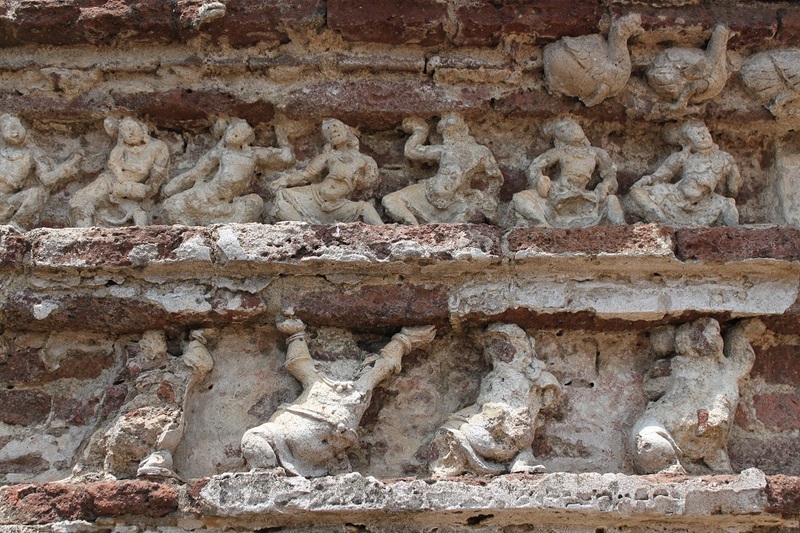 Most ancient ruins have inspired me in different ways. Thanks! 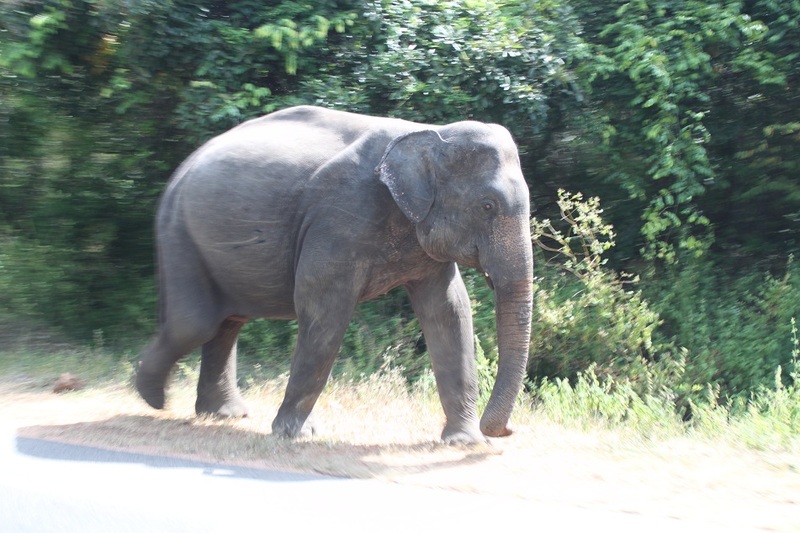 I love the wild elephant on the highway – such a contrast with the cars! That was my first time ever seeing wild elephants. Definitely one of the best unexpected moments ever for me. 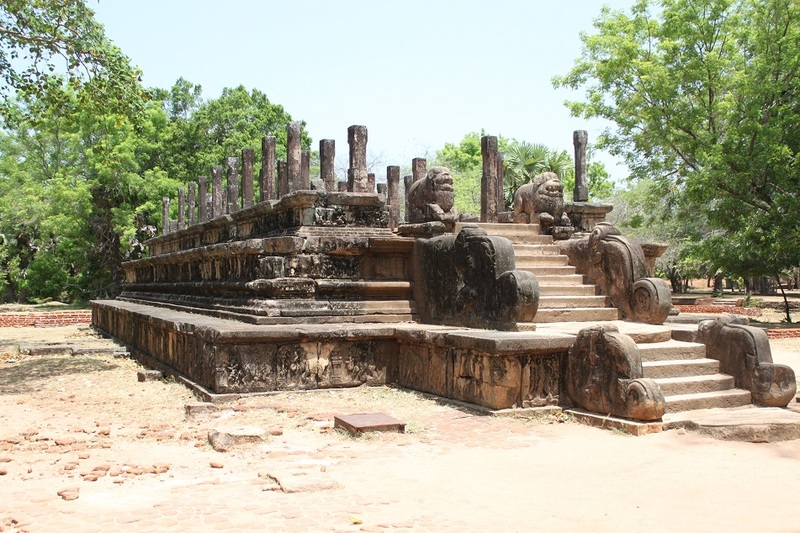 Polonnaruwa looks amazing – I can just imagine how magical the ruins must be at sunrise or sunset, with few other people around! Thanks for another great post, Bama! It would be as magical as that picture of yours from Zaragoza, James. 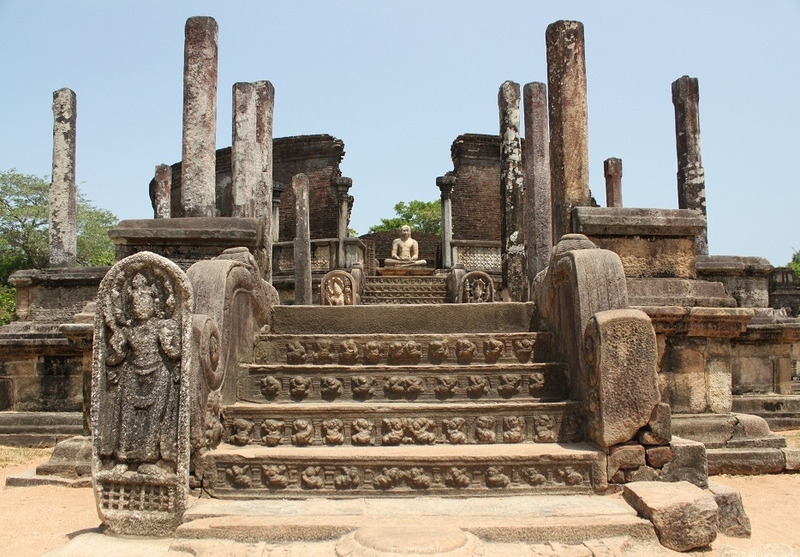 Fortunately my camera still managed to capture some colors from the ruins at Polonnaruwa because the place was set ablaze by the sun, figuratively speaking. Thanks! Thanks for the tour of Sri Lanka! Love the elephant walking shot! Yes, you have to make your way to this place one day. 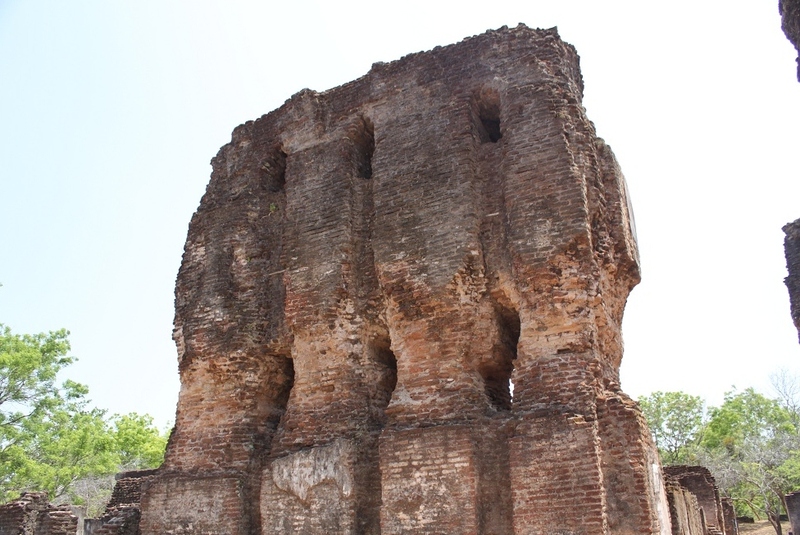 Bama, I love ruins of ancient cities! This one really looks magnificent. 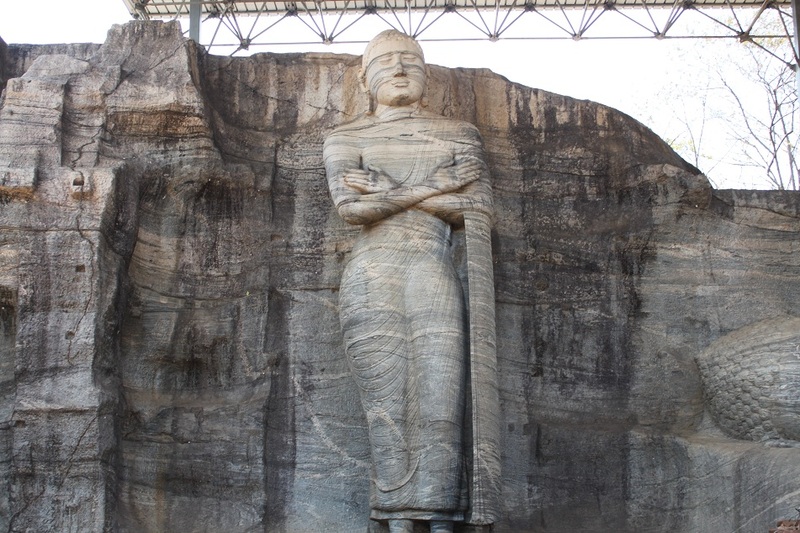 My husband and I were supposed to travel to Sri Lanka in May but to change plans last minute. But thanks for letting us travel there vicariously through your photos. Nice shots. Well, one day you need to plan for a visit to Sri Lanka. It’s such a beautiful country! Thanks for your comment! That elephant photo is priceless! I’m glad I hit the button just at the right time! Thanks Stephanie! Thanks Madhu! You know how I love taking pictures of architectural details. 🙂 But seeing wild elephants roaming near a highway is definitely not something I often see. The same thing happens here, especially in Java – the world’s most densely populated island. Wild animals are disappearing fast. So sad, indeed. But I hope those elephants in Sri Lanka have brighter future. This is incredible. 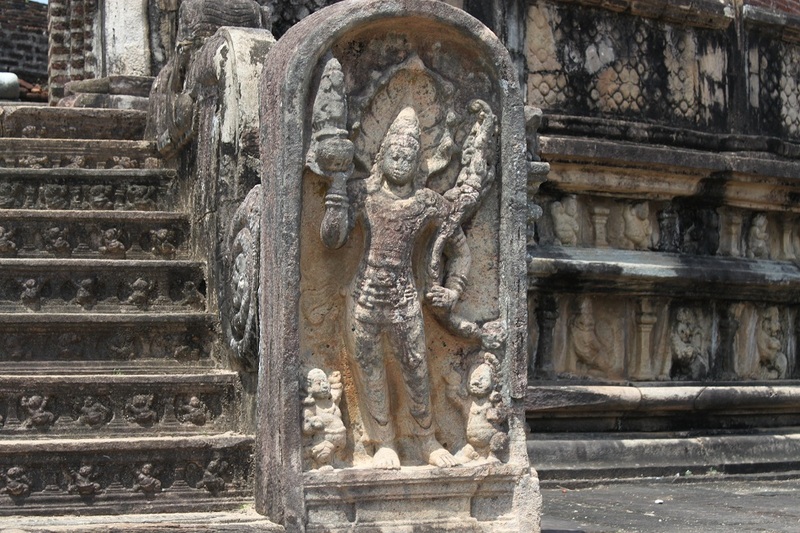 Sri Lanka is one of Asia’s best secrets, hidden in plain sight. Reminds me a lot of Hampi in South India- a truly magical place. You should go if you can. 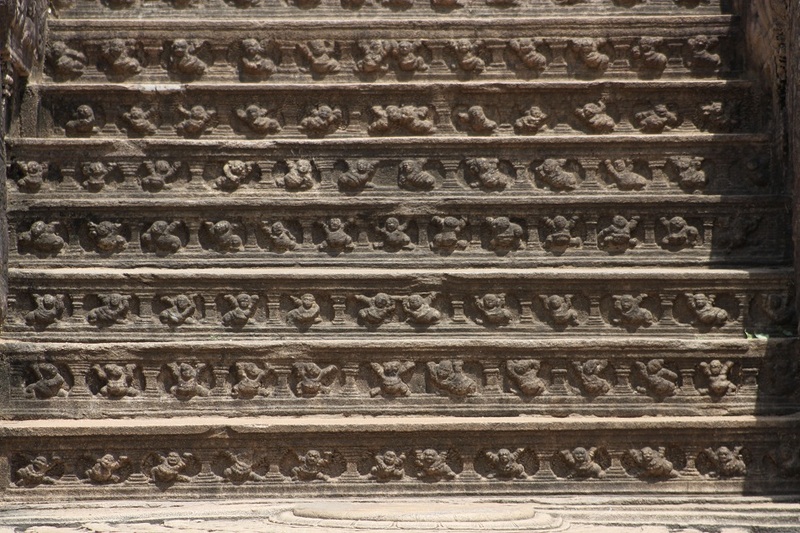 The first time I learned about Hampi was about four years ago, and I have been captivated by its beauty ever since. I would love to make it to Hampi when I go to India one day. I’ve always been amazed by historical places more so if there are ruins (or those that are candidates for ruins if you know what I mean) in it. Ruins are beautiful because they are the roads to transformation. Ruins always bring my mind wander to the past, imagining how life would have looked like when they were still in use. Man, your writing is pretty great nowadays. Feels like I read a piece of travel information from a travel magazine. Looking at your pictures, I figured the weather is seriously hot there. And that place looks ancient. Thanks a lot, Robin! I’m not sure if my writing is comparable to the articles of a travel magazine. About the weather, you’re right. It was unbelievably hot – I went there in June, the hottest month in a year. Reblogged this on Master My Destiny. They did the same thing to me! 🙂 Thanks!